When Chef Vishal Atreya, executive chef, The Imperial New Delhi travelled through Italy he observed that many Italians use flour from different grains to make pizza bases. This, plus his prior work experience at Ananda In The Himalayas and his personal preference for healthy food inspired him to introduce Healthy Pizzas at San Gimignano. With people becoming increasingly health conscious there is a growing demand for healthier options even when they eat out. While the world is going ga-ga over organic produce without knowing for sure whether the labels are authentic or not, Chef Vishal explains that for anything to be truly organic the entire chain from the quality of the soil to the final distribution has to be so, which is very hard to monitor. Although he would ultimately like to use zero-pesticide produce in the hotel, currently he is content with offering a healthier alternative that he is sure of. “Grains like buckwheat and millets have been used in Indian cooking for centuries. The flour obtained from these grains is healthier than regular flour and the complex carbohydrates that they provide add natural fibre to our diet,” he says. But being part of a hotel that has been known to serve delicious fare in its various restaurants, Chef Vishal was very clear about one thing – he could not compromise on taste in an attempt to make something healthier. Since completely eliminating regular flour in a pizza base is not possible, after months of experimenting, he and his team attained the perfect proportion of alternate grains to 00 flour (Italian milled flour that is specifically used for pasta/pizza making) to maintain the crispness of a good thin crust pizza. They have thus managed to replace flour with healthier alternatives by almost 60-70% and use a marginal amount of yeast. 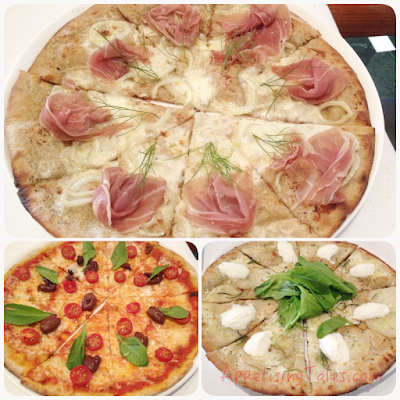 The result is the delicious range of healthy pizzas. Currently the following healthy pizzas are on offer: Dark Rye base with Gorgonzola, fennel and Parma ham; Buckwheat base with sour cream, rosemary potatoes, rocket and baby spinach; and, Millet base with cherry tomatoes, spinach and olives. Bottom Right: Buckwheat base with sour cream, rosemary potatoes, rocket. I tried all three and enjoyed their rustic appeal and well-balanced flavours. Not only did I not miss the regular pizzas, but given a choice I would order these kinds of pizzas wherever possible. Prices: Healthy Pizzas Rs 1300 onwards.